Limited View won the Marshua Stakes at Laurel Park. Photo by Laurie Asseo. After putting her brilliance on display with five wins from seven starts sprinting, three of those victories coming in stakes, Limited View will stretch out to a mile for her latest engagement in Saturday’s $100,000 Beyond the Wire at Laurel Park. She is the 5-2 co-second choice in the field of eight. The 30th running of the Beyond the Wire for 3-year-old fillies, previously run as the Caesar’s Wish, is among five stakes worth $450,000 in purses on the 11-race St. Patrick’s Day program. First race post time is 1:10 p.m. Owned by Fred Wasserloos, George Greenwalt and trainer John Salzman Jr., Limited View exits a three-quarter-length victory in the six-furlong Marshua Stakes Jan. 27 at Laurel in her sophomore debut, a race where she was bumped at the start but came with a four-wide run down the stretch. It was a marked difference from her previous start, when the temperamental Limited View finished a distant ninth in the seven-furlong Gin Talking at Laurel under her regular rider, Hall of Famer Edgar Prado, who is closing in on 7,000 career wins. “It was exciting, she ran good and she got there. As long as you don’t panic on her, she’s going to run her race,” Salzman said. “She’s pretty easy to ride if you can just get a clear trip with her and sit still on her, and Edgar does a great job with her. A bay daughter of 2013 Peter Pan (G2) winner Freedom Child, named the Maryland-bred champion 2-year-old filly of 2017, Limited View sizzled in her last of three works for the Beyond the Wire, going a half-mile in 45.40 seconds, handily, March 10 at Laurel, the fastest of 59 horses at the distance. Salzman is taking a gradual approach to seeing how far Limited View wants to go, while keeping an eye on races such as the $150,000 Adena Springs Miss Preakness (G3), run at six furlongs May 18, Black-Eyed Susan Day at historic Pimlico Race Course. “I’m a sprint guy. I’m not one of those guys that’s in a big hurry to stretch horses out. There’s not a lot of choices. I have the mile race here. I could ship her to New York and run her three-quarters, but with the circumstances with her I’d rather stay at home,” Salzman said. “If you watch her breeze you see she’s got a big, long stride and I think Edgar is going to be one of the best at it if she’s going to go a mile. I think she will go long, I’m just in no big hurry. 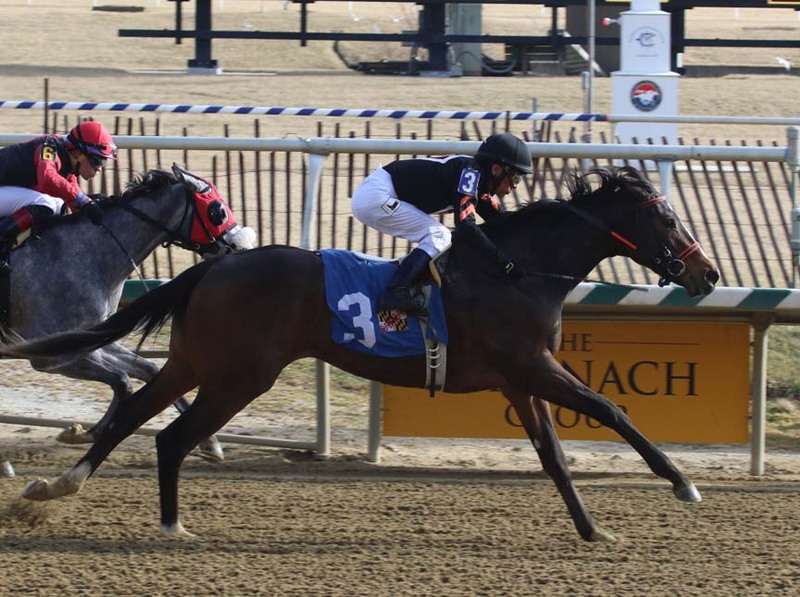 Stormy Stable’s Deep Red, second to Limited View in the Maryland Juvenile Filly Championship Dec. 9 at Laurel, came back with a three-quarter-length optional claiming allowance victory going 5 ½ furlongs Jan. 21. Most recently, she was second to Enchanted Ghost in the seven-furlong Wide Country Stakes over a muddy, sealed track Feb. 17. Deep Red is 12-1 on the morning line. Trainer Damon Dilodovico claimed Deep Red, a chestnut daughter of Algorithms, for $25,000 last summer at Laurel and she has two wins, three seconds and a third from seven starts since. Her two runner-up stakes finishes came in her only two tries at seven furlongs, her longest trips to date. “I was pretty happy with her last race,” Dilodovico said. “In her last two starts she hasn’t necessarily had things go her way. Since I’ve had her I’ve been anxious to run her a little bit further. In the one seven-eighths race, [Limited View] had things her own way that day and looked so comfortable doing it, and we kind of rallied into that. A pair of New York shippers that should figure prominently in their stakes debuts are Repole Stable homebred Mo Shopping and Wise Racing’s Fools Gold, the latter coming off a 7 ¾-length maiden triumph going one mile Jan. 26 at Aqueduct for trainer Chad Brown. Mo Shopping, a bay daughter of champion and leading sire Uncle Mo, exits two consecutive victories by a combined 6 ¼ lengths since being moved to the dirt by trainer Todd Pletcher. The latest came in her first time against winners, also at a mile. Also entered are Smokinpaddylassie, unbeaten in two career starts at Parx; Sakes On a Plane; Vente to Go, third in the Maryland Juvenile Filly Championship; and Frigid Sister, most recently fourth in the Wide Country.